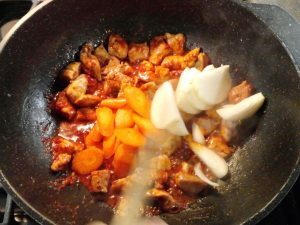 Stir-fried Spicy Pork (Jaeyook Bokeum – 제육볶음) – Yori, Hey! Korean hot pepper is what make so many dishes distinctly Korean. The spicy and sweet flavor of the pepper adds both kick and flavor to dishes without making them too spicy. This recipe is a quick, stir-fried dish that you can make in about 20 minutes. Served over rice with sheets of seaweed laver to wrap and it makes a filling lunch or dinner main dish. 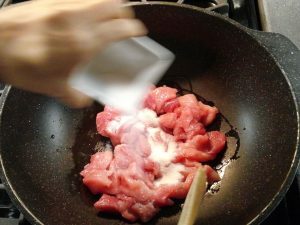 Cut the meat into small strips or cubes. 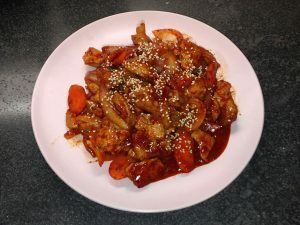 Ingredients needed for Korean Spicy stir-fried pork: hot pepper paste, hot pepper flakes, sugar, minced garlic, soy sauce, sesame oil, sesame seeds, chopped onions, chopped carrots, chopped pork. 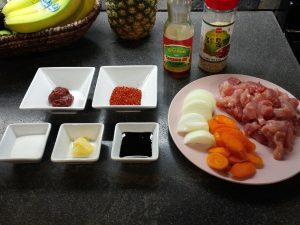 Make the sauce: In a bowl, combine and mix the hot pepper paste, hot pepper flakes, soy sauce, minced garlic. Mix the sauce. 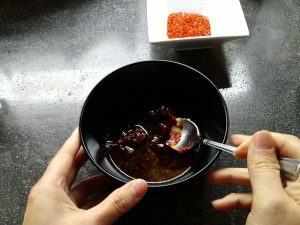 Hot pepper paste, hot pepper flakes, soy sauce, minced garlic, sugar, sesame oil. Heat at large wok on high heat. Add some oil. Add the meat and sugar then begin stir-frying the meat. Do this until the meat starts turning whitish in color. Heat the wok and add oil and meat. Stir in sugar and start to stir-fry. 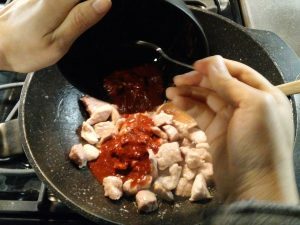 Pour the sauce and mix into the meat while still stir-frying. Add the sauce to the meat once the meat is whitish in color. Add the vegetables and continue to stir-fry. Stir-fry the vegetables into the meat. Cook until the sauce is thoroughly mixed into the meat and vegetables. Remove from heat and serve onto a serving plate. Sprinkle sesame seeds for garnish. Prepared dish of Jaeyook Bokeum. Sprinkle sesame seeds on top for garnish. Let us know in the comments if you tried this recipe. Thanks for reading!